For most of us, the holidays are all about spending quality time with those you love. Unfortunately, we sometimes can’t spend the holidays with our special someone. Some people have to work over the holidays, some are visiting other family members, and some simply can’t afford the high ticket prices of holiday travel. So what can you do to brighten your special someone’s day when you’re apart during the holidays? A thoughtful Christmas care package! 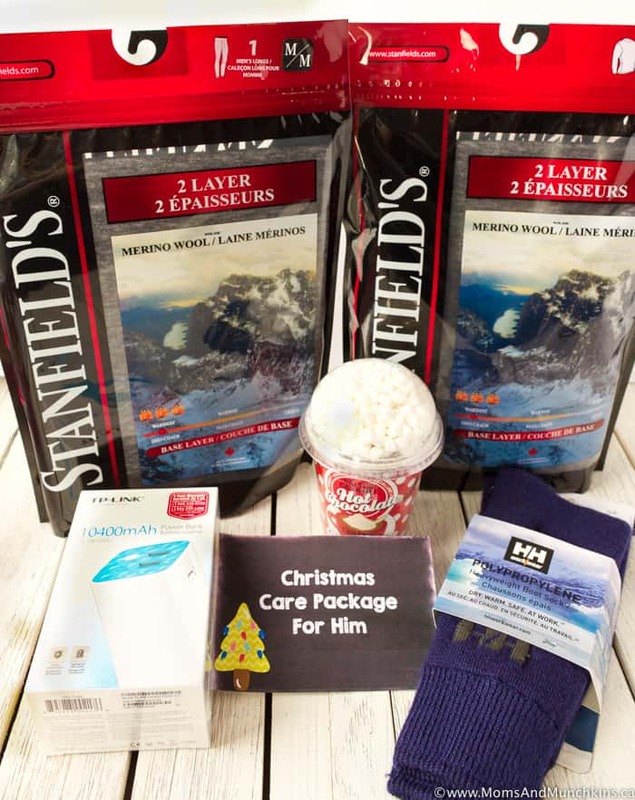 In this post, I’ll share ideas for a Christmas care package for him but it’s easy to make some little adjustments and turn this into a Christmas care package for her. Plus we have all the free printables to help you get started! To help you brainstorm ideas for a Christmas care package, you could start with a theme. Maybe your guy likes tech stuff, maybe he’s a gamer, maybe he loves to cook, he may have a sporting team that he loves, he may have a goofy sense of humor and you can fill your Christmas care package with silly things that remind him of inside jokes you guys share together…the possibilities for theme ideas are endless! My Christmas care package started with a trip to Mark’s to check out their selection of clothing, shoes and accessories for guys. There are so many great Christmas items already in stock that would be perfect for a Christmas care package! Check out those Christmas socks with themed sports teams! 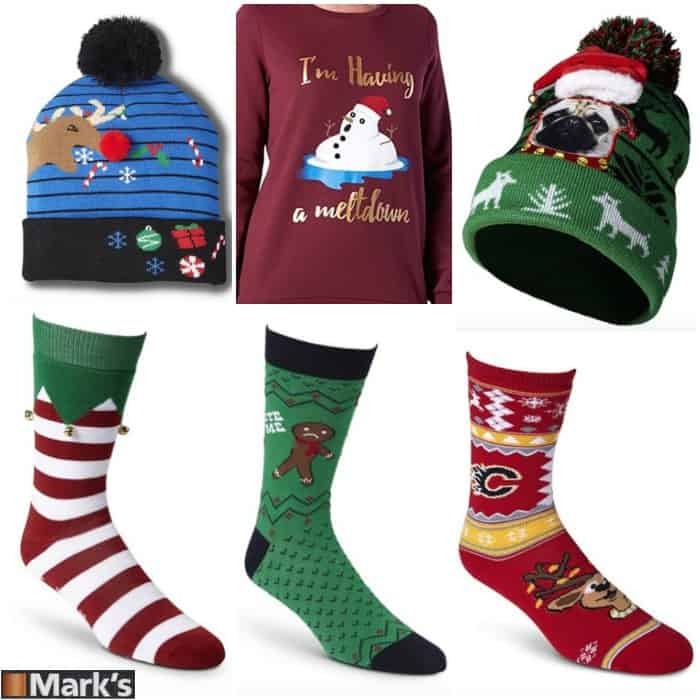 If you’re attending an Ugly Christmas Sweater party this holiday season, check out the great accessories like toques and socks. For this Christmas care package for him, I went with some items to keep him warm while he’s away from his cuddle partner. 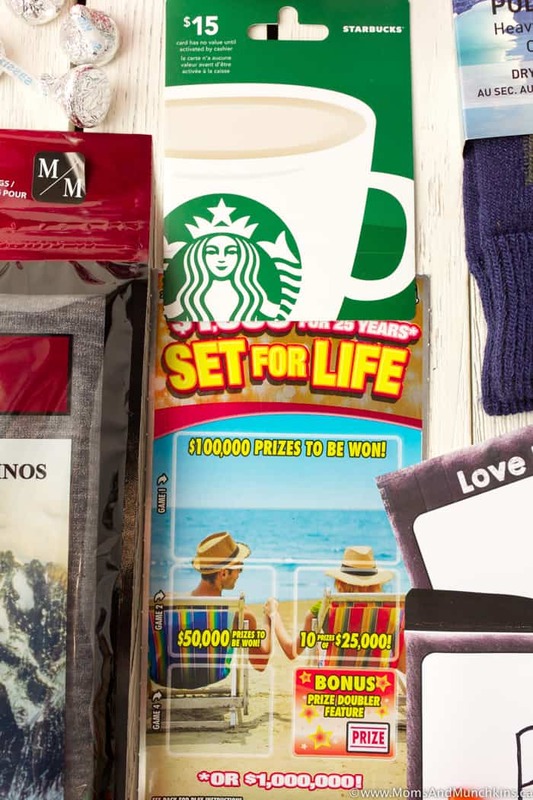 This package included some long underwear and an undershirt (both from Mark’s so you know it’s great quality) to keep him warm in the cold winter weather, warm socks, hot chocolate, homemade muffins, Starbucks gift card, plus a few cute extras. The extras included a scratch lottery ticket (you could include a note here about how you feel like you won the lottery with him), a portable power bank charger so he never runs out of smartphone battery while you guys are on the phone together, plus some sweets (candy) for your sweet with cute tags. Let’s hope over to the free printables for some more ideas! I’m all about the silly puns and mushy love notes so I had to include some of these in the free printable package. 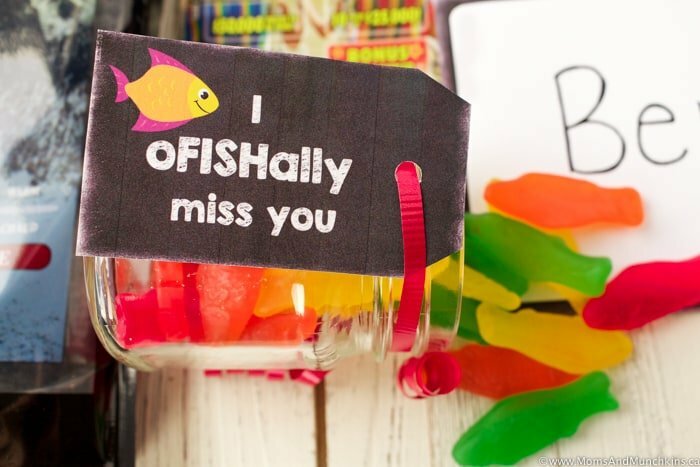 First up is a tag for “I oFISHally miss you” that you could attached to some Swedish fish. 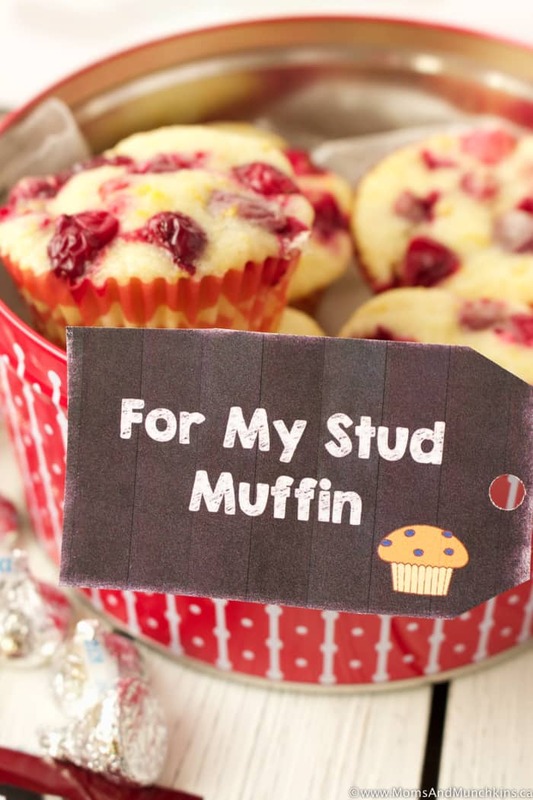 Next is a “For My Stud Muffin” tag that you could attach to some homemade muffins. Looking for a delicious muffin recipe? I recommend these Cranberry Orange Muffins – the perfect combination of sweet & tart. We also have a free printable “Love Letter” with envelope for you to leave your sweetie a thoughtful note. 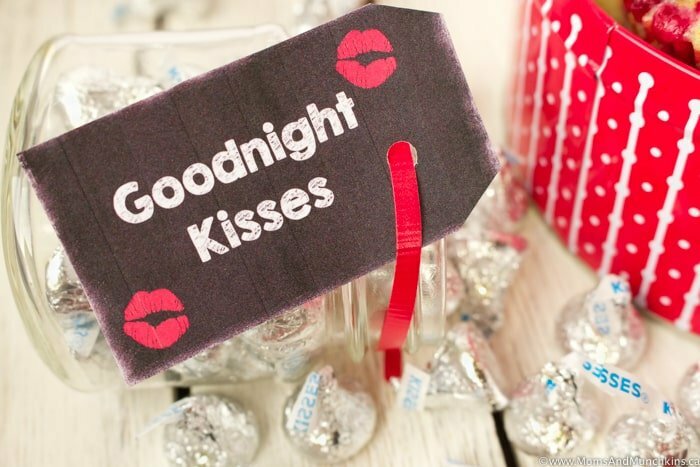 Of course we can’t forget the “Goodnight Kisses” tag for Hershey’s kisses! 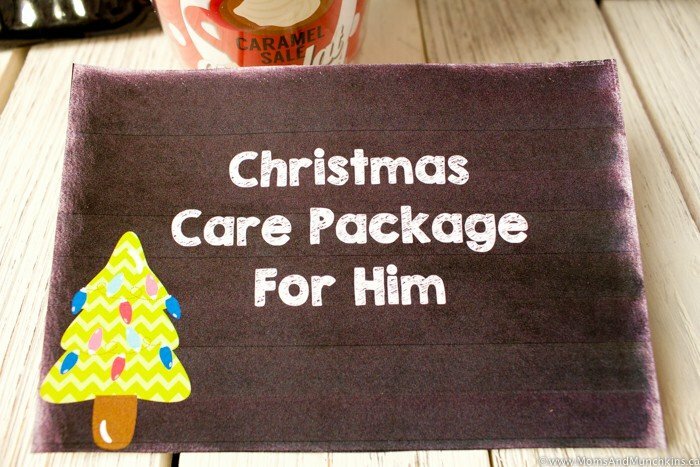 To finish it all off, we have a “Christmas Care Package For Him” label plus the free printable set includes a “Christmas Care Package for Her” label as well. Thank you to the fabulous Wendy of Wendy’s Printable Party for creating these free printables for us! You can download the Christmas Care Package For Him free printable set here. 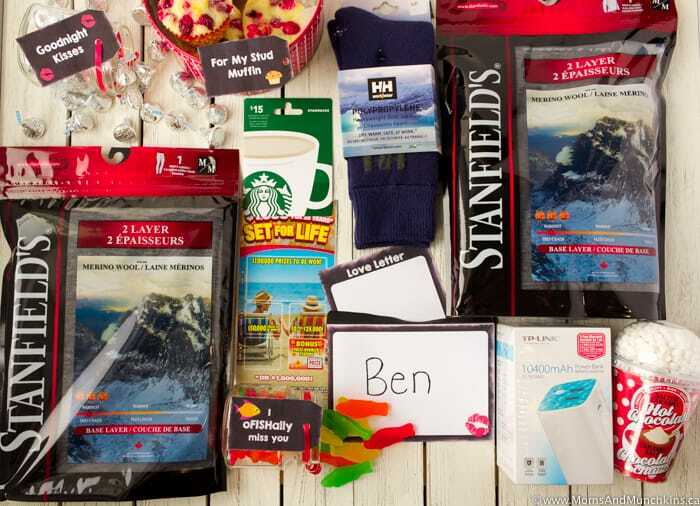 Ready to start brainstorming your own ideas for a Christmas care package for him? I recommend you start at Mark’s to get him some items you’ll know he’ll use like clothing, underwear, socks, and other accessories. They have a great selection so you’re sure to find something perfect for the special guy (or girl) in your life. If you’re lucky enough to have a night with your sweetie during the holiday season, check out this Date Night Before Christmas idea. Visit our Date Night page for more date ideas and free printables. Planning for a Christmas celebration? Visit our Christmas Fun page for free printable games, recipe ideas and more. Stay updated on the latest by following us on Pinterest, Instagram, Facebook and Twitter.